Brolin and Del Toro are back as C.I.A. agent Matt Graver and his “man on fire” Alejandro in the first trailer for Sicario 2: Soldado, Entertainment Weekly‘s exclusive preview of what’s next in this volatile war on drugs. While Sicario focused on Emily Blunt’s F.B.I. agent Kate Macer and her recruitment into this off-the-books cartel-hunting task force, the sequel sees what happens when it’s just Matt and Alejandro operating with no oversight. In Soldado, the drug war has escalated as the cartels have shifted to trafficking terrorists across the U.S.-Mexico border, and that’s when Matt’s bosses — including one played by Catherine Keener — ask him to intervene. But there are even more changes. Two other faces from the original, director Dennis Villeneuve (Blade Runner 2049) and cinematographer Roger Deakins, aren’t returning for Soldado. It’s Stefano Sollima (Suburra) at the helm, but Del Toro says the filmmaker proved through his work to be one to watch. 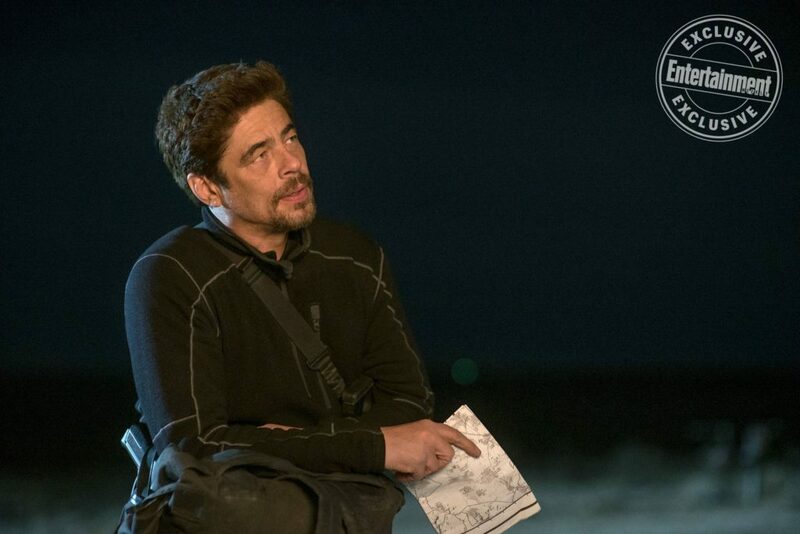 See the first trailer for Sicario 2: Soldado above, plus exclusive photos and more from Del Toro’s interview with EW below. ENTERTAINMENT WEEKLY: What can you say about Alejandro, where we find him now and his arc in this film? BENICIO DEL TORO: We learn from Alejandro in Sicario that he was a man who was motivated by revenge, right? And then in Soldado, he gets selected to a new assignment by Josh Brolin and then at some point he’s at a crossroads in that situation where he either has to follow orders or make the right decision, and so that’s kind of where the character’s stuck, you know? And that’s the cool thing about the character, is that he’s got to make a decision and then the consequences will follow if he goes this way or the other way, so I would say that’s the difference for the character in this movie versus the Alejandro in Sicario. How does this movie compare to the original? I think the characters are faced with more decisions, more forks in the road. I could say the same for Josh’s character and for Alejandro. They have to make decisions that are more difficult, perhaps. … There are difficult decisions that both characters have to make, I would say for Matt and Alejandro — and also I think it’s a little more than, like saying that, in Sicario there [are] moments where they make decisions but the decisions are all going in one direction. Here, the decisions and the surprises are kind of like unexpected, so the decisions are unexpected decisions which makes it a little bit more complicated for the character. … Let me put it this way, the characters in this one really try to think on their toes, to react in the spirit of the moment because of complications. When I think [about] Sicario, there were moments like that but they were under control, they had everything under control beforehand. In this point in time, they do as well, but then things start to not happen as planned, let’s put it that way. When you think about Emily Blunt’s role in the first movie, she was the audience’s lens into the world of Sicario. With Soldado, where do you think that audience connection or that human factor comes from? I think it comes from the character of Isabelle, which is played by Isabella Moner. She’s terrific in the movie, very strong, and I think that that’s part that’s gonna “replace,” if we could even say that, that feeling that we had for Emily Blunt’s character, Kate, in Sicario. You have a different director this time around, and a different cinematographer as well. We see little snippets of how things are different in the trailer, but from your perspective, what would you saw are the biggest differences between Stefano Sollima and Denis Villeneuve’s approach and execution of this material? I’d say Stefano brings in a little bit more of a, maybe a European sensibility, but Denis brings in something, you know, he’s the original director… I had a good time working with both of them, it was just, like, much respect for both of them. I think that Stefano had to come in a little bit like, you know, where Josh and myself, we have played these characters before, so he had to deal a little bit with that, and I think he did a really good job of allowing both Josh and myself to put ourselves on the table about the characters and how they would react in situations and all that stuff, so it was very inclusive that way. And I think both of them are extremely talented and I think Stefano, under the circumstances, is coming in and being the director of these movies and the style and success… I think Sicario is cinematically, in terms of cinematically, he did a really good job and in terms of bringing that quality — the standards of the quality — up. I don’t know if there’s one single thing that I would say. … I think they are both very talented and I think Stefano showed that he was definitely one of those really up-and-coming directors. I think it’s also interesting that when the cast and crew have been talking about this movie, Soldado has been described as being an anthology film as opposed to a direct sequel, and yet the title for this film is Sicario 2: Soldado. So, I’m curious, is the standalone format still the focus for this film? Well, I think it could stand alone, definitely. I think it could stand alone because it’s a different assignment, you know? So it’s like two guys getting an assignment. I think that we project what we know from, in the original — in Sicario — and that we’re… subjected to the characters in this movie, but even after Sicario I think we still could have the feeling for these characters and get to know them in this movie about who they are and what they do. So I think it does stand alone. I don’t think it needs… It’s just a new assignment, you know? Matt and Alejandro go on a different assignment. Do the events of Soldado happen after the events of Sicario? Yes. Yes, I believe so. I haven’t seen the very final, final cut, but yeah, I do believe that they are after the events of Sicario. Taylor and Stefano have both teased the possibility of doing a third installment after this film. Is that something that you’ve already discussed with the producers? No, not as of today, but I’d be interested to see what’s the idea. Sicario 2: Soldado is scheduled for theaters on June 29, 2018.